First things first – to those who follow my blog and have been asking about an update on life and a concluding chapter to the Gran Carambano series, my apologies. 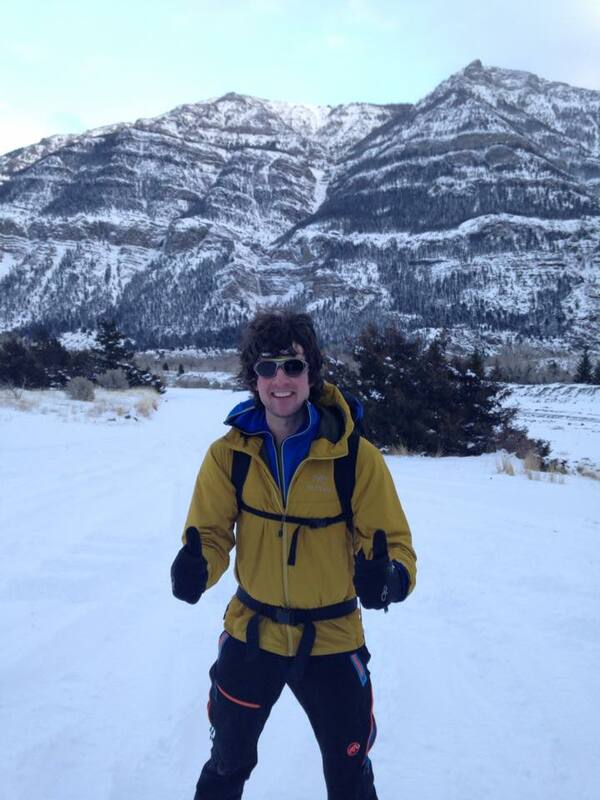 Life got really busy in the weeks before Christmas as I prepped for my training trip out to Montana and Wyoming with Olin. The eight consecutive days of ice climbing were incredible, and I came back on January 4th bursting with stories and experiences for a new post…only to find that my MacBook had crashed and burned, taking with it the rough draft to the final chapter of Gran Carambano and my normal means of updating my blog. So here I sit on my work computer (on my lunch break), ready to bang out some of the high points of the trip with swollen knuckles and sore muscles. 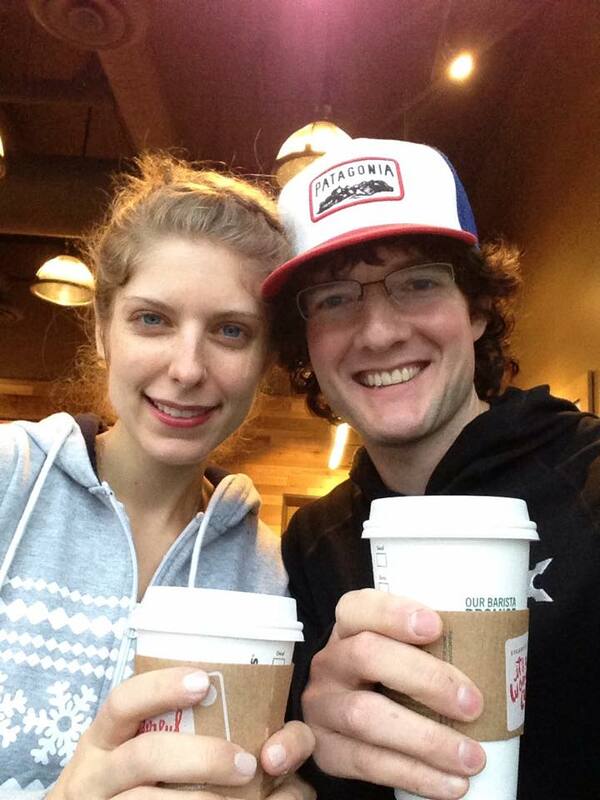 Enjoying a Christmas morning Starbucks run with my amazing girlfriend. My flight to Montana left at 1630 on Christmas Day, so I was able to spend the morning and early afternoon with my girlfriend, Liz. A 0600 run, a quick jaunt to Starbucks for caffeine, hot cocoa with peppermint schnapps, lots of bacon with breakfast, baking and decorating sugar cookies, and exchanging gifts made the time fly by all too quickly, and soon it was time to grab my overloaded duffle bags and head off to the airport. After a short layover in Seattle, I walked out on the tarmac and boarded the turboprop teeth-rattler to Great Falls, MT. I’ve been on those planes before, but flying on Christmas made it a truly unique experience. As there were sixteen young children on board (apparently the most that the flight crew had ever seen), the head stewardess took it upon herself to lead the whole damn plane in an intermittent series of Christmas carols to celebrate the joyous occasion. I drank two of those little glass bottles of Jack Daniels and tried my best to pass out, but I had unwittingly picked a seat right on the wing, and was therefore treated to maximum noise and vibration from the shuddering propellers. I deplaned in Great Falls at 2300 to find temperatures hovering around a frosty -2 degrees F…probably should have worn one of my jackets instead of packing them all! Olin was waiting there in his Subaru to pick me up – and even better, he had a bottle of his homemade mead. I’m pretty sure it was only about eleven percent alcohol, but by the time we got back to his parents house in Ulm, I was crashing hard. We dumped my gear in the heated room of his dad’s aircraft hanger, and after consuming a lot of Christmas sweets that I found sitting out on the kitchen cupboard (carb-loading for the climbing ahead) I stumbled down to the basement to pass out on the pullout couch. The next morning started off right – coffee, lefse, coffee cake, homemade sausages, and a shot of Black Velvet just to wash it all down. Olin was already packing what looked like enough food and gear to take on the southwest pillar of Nuptse. My internal “light is right” programming was being seriously challenged by the huge stack of duffles and coolers that was amassing near the front door. Olin insisted we needed it all though, and as long term winter camping was more his specialty, I shut my mouth and started playing jenga to fit it all in his vehicle. Even with the seats folded down, gear was crammed into every available inch by the time we got fit it all inside. A quick run back inside the house to retrieve the remainder of the whiskey we had started over breakfast, and it was time to hit the road. 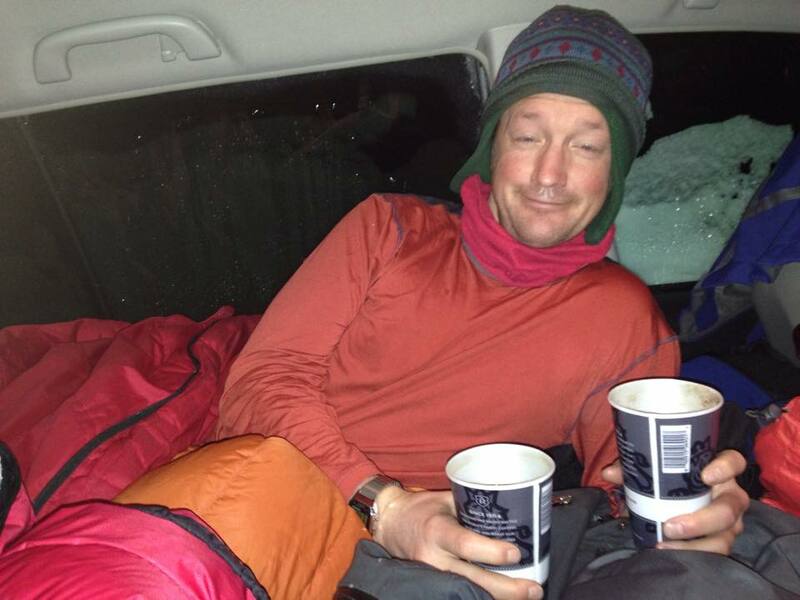 Olin providing all the comforts of home as he serves up an early morning cup of coffee in the Hotel Subaru. Olin and I began to set up camp, and it was then that his genius in winter camping and packing became evident. The popup ice house went up first, and with the propane heater roaring away, we were down to just our base layers within minutes. After hauling the coolers inside our shelter, Olin began popping lids off tubs and opening coolers – one large cooler was packed full with home-brewed beer, and the others contained more fresh bread, meat, vegetables, sweets, condiments, candy, and snacks than we could have eaten in three weeks. I was in heaven. By the time we finished our dinner of elk sausage, pasta, and Special K bars, I had vowed to never again criticize Olin for bringing so much stuff on a trip. 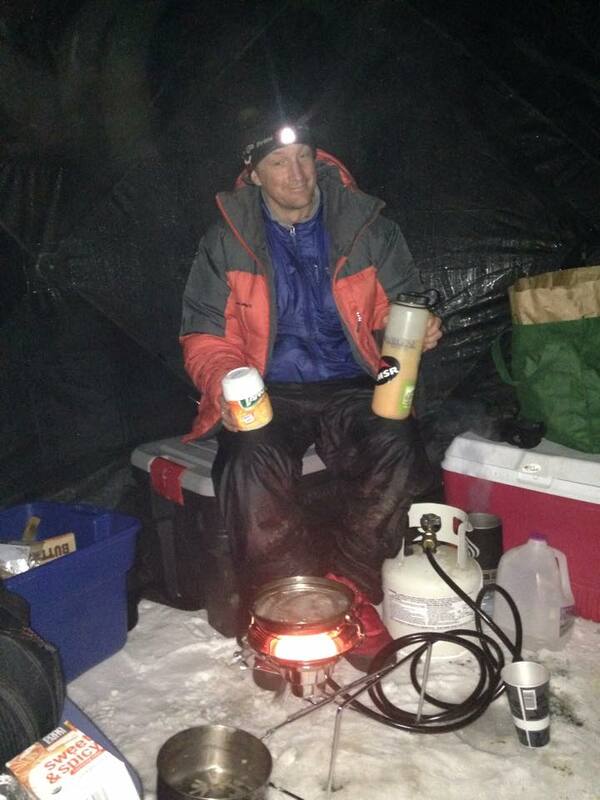 Olin mixing Tang and frying sausages for dinner in our propane-heated ice house. On to the climbing! 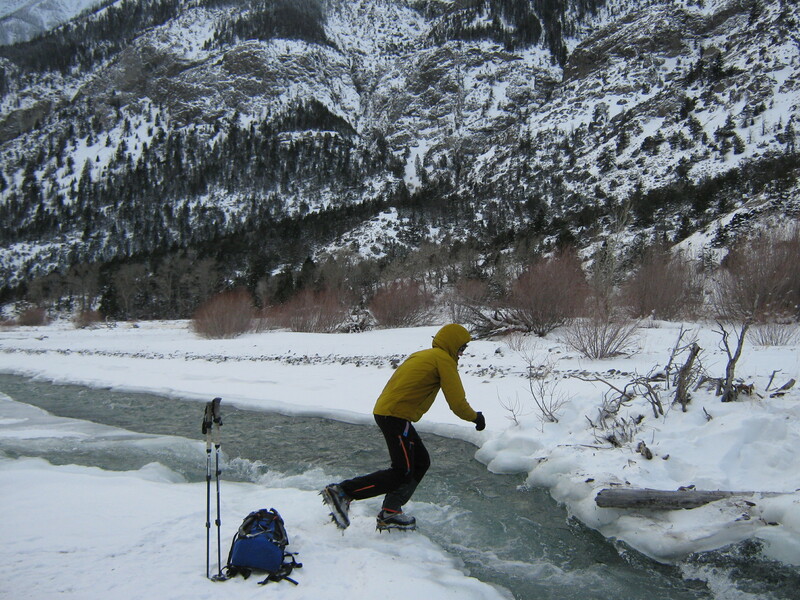 We woke up early the next morning, and started what would end up being eight consecutive days of climbing in the South Fork Canyon and in Hyalite Canyon. I thought about giving a blow-by-blow account of each route, but this blog post would end up at novel length. Instead, I’ll post some of my favorite pictures from the trip. 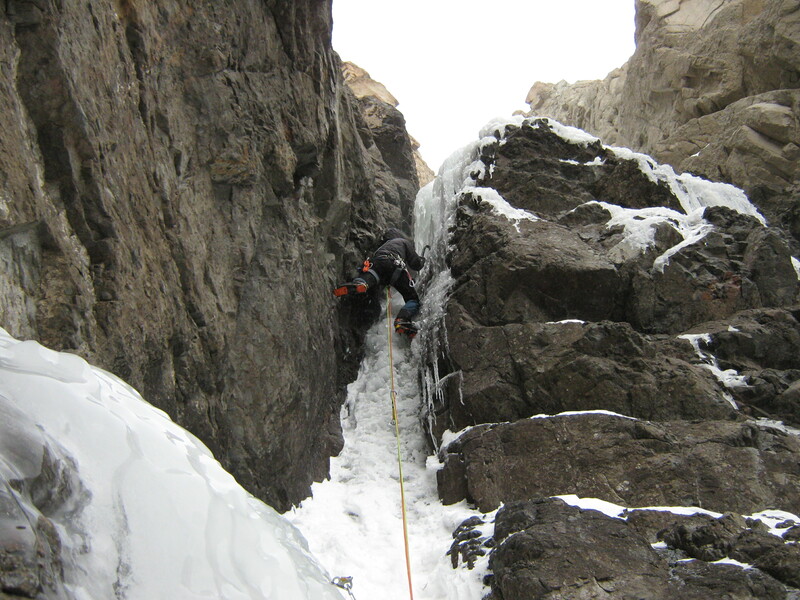 We didn’t take many, as the climber was usually focused on climbing and the belayer was similarly focused on belaying. If anyone has any questions about specific routes or gear, feel free to comment and ask! 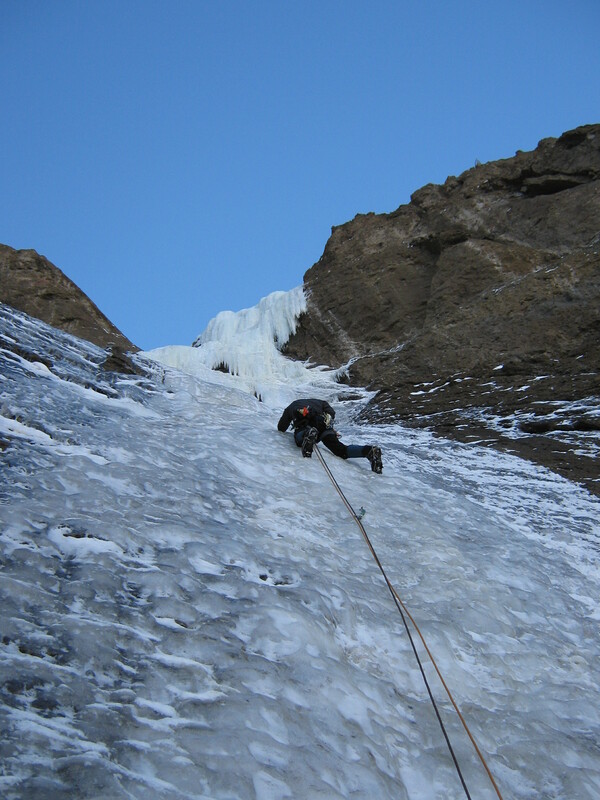 Topping out on the second pitch of Mean Green. Jumping across the river on the way back to camp after the first day of climbing. 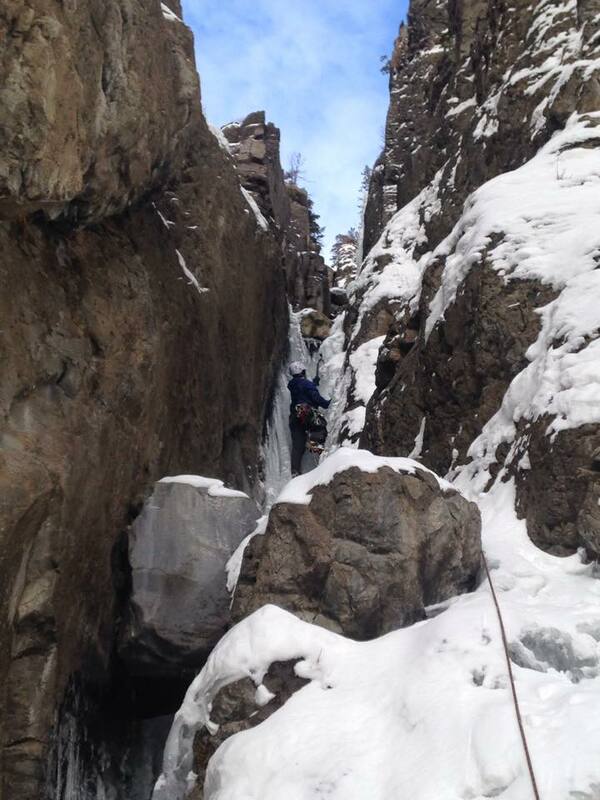 Wrapping up the first day of ice climbing in the South Fork Canyon. 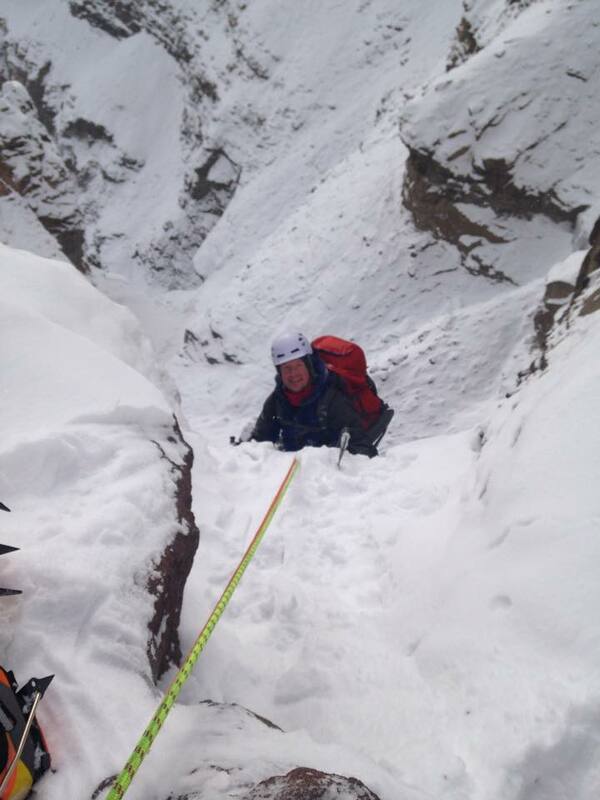 Having fun leading the stellar third pitch of Broken Hearts. Olin seconding the third pitch of Broken Hearts. 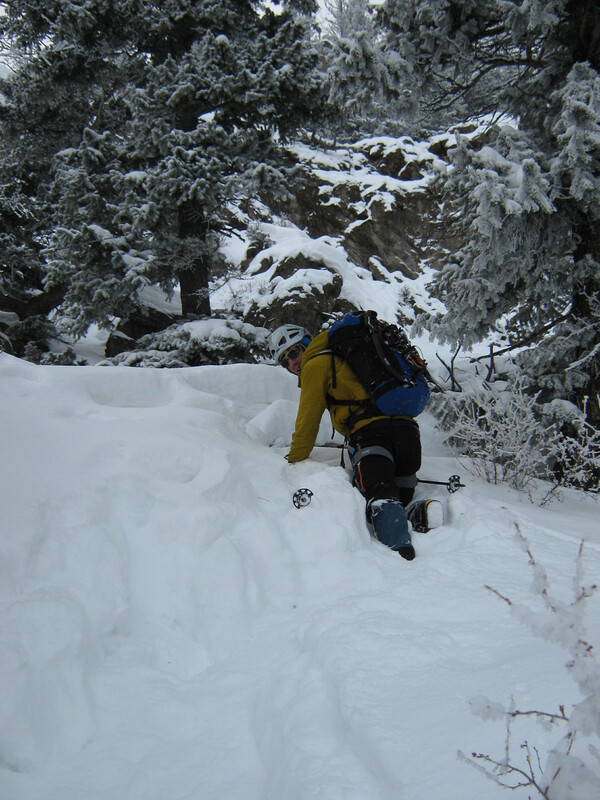 Plowing a trench up the ridge after we tried to walk off the top of Broken Hearts. In hindsight, rappelling the route off v-threads and sketchy anchor tat would have been a lot less work and probably safer. Leading the fantastic but short second pitch of One-Armed Bandit. Leading up the first pitch of The Moratorium. 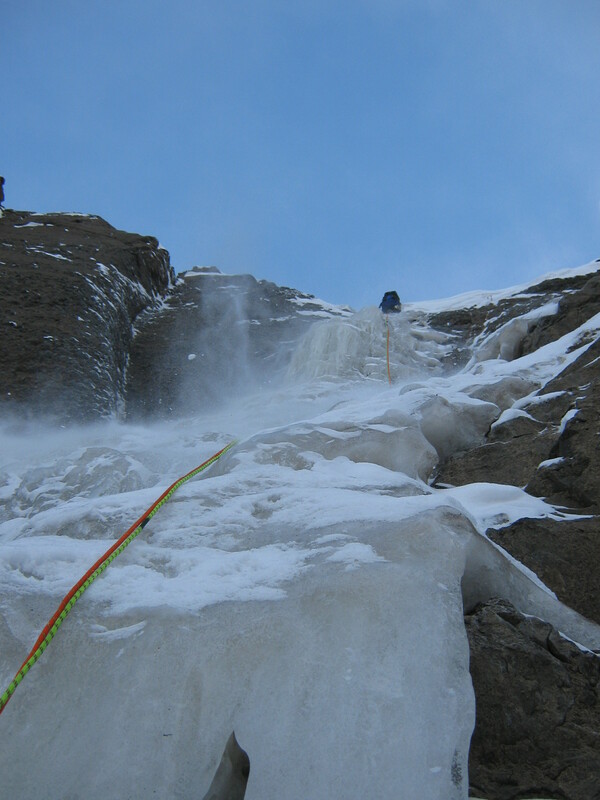 It wasn’t very hard climbing, but the ice was thin – I could only place two 10cm ice screws in the first 40 meters. Olin leading the ice steps on Too Cold To Fire. 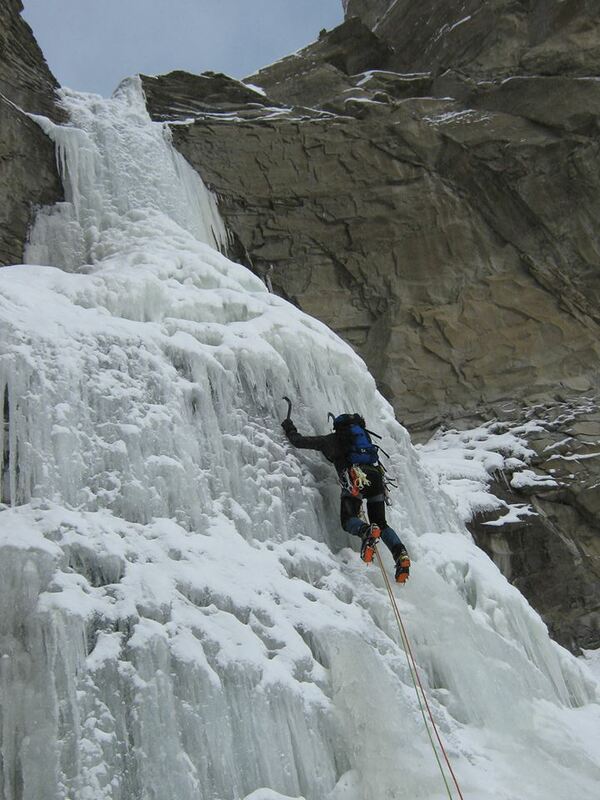 Olin rappelling the crux pitch of Too Cold To Fire. All in all, it was a fantastic trip. There were a couple of days when the thermometer refused to budge above zero, but we still managed to climb something every single day. 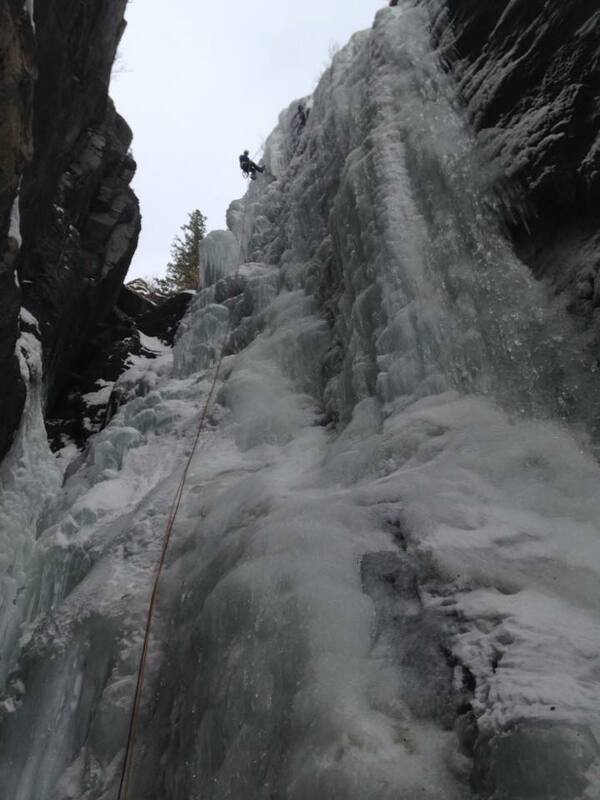 Minnesota has some decent ice climbing, but it was very satisfying to get out on the “big boy ice” out west. I came back feeling a lot stronger and more mentally prepared for the trip to Switzerland in February, and Olin and I are already making plans for a trip up to Canada next season. It was a perfect end to 2014 and a great beginning to 2015!